What this instrument will do is use an acoustic technique to image the shape of hydrothermal vent plumes. 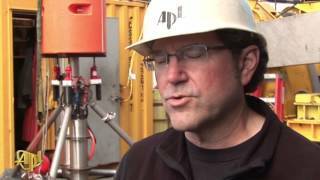 We’ll also use this acoustic technique to measure the flow rate of these plumes using a sonar processing technology called Doppler processing. 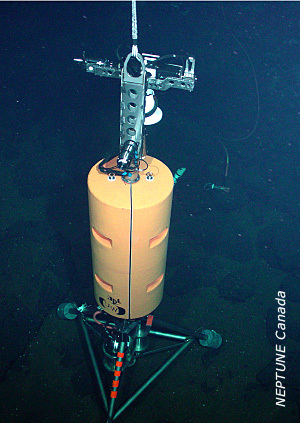 COVIS was successfully deployed on 29 September 2010 and connected to the NEPTUNE Canada regional cabled ocean observatory to image hydrothermal vent complexes. 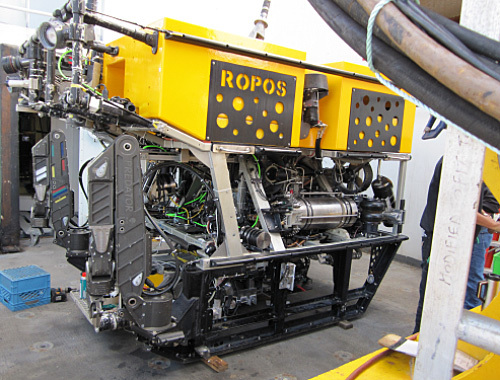 The sonar system was set down at about 2200 m depth by the ROV ROPOS, operated from the R/V Thompson, in the Main Endeavor Field, where it will have good sonar views of the Grotto and North Tower complexes of black smokers venting from mineralized chimneys. COVIS is operating in coordination with many other instruments at the vents (measuring temperature, chemistry, and biology) emplaced by other investigators. The NEPTUNE Canada cabled observatory system provides power and bandwidth that will enable the sonar images to stream for months to years in the future. Researchers will be able to measure the geometry and discharge rates of buoyant hydrothermal plumes and detect the linkages between the flow and forcing processes including tidal cycles, earthquakes on the Juan de Fuca plate, and volcanic activity. Rona, P., and R. Light, "Sonar images hydrothermal vents in seafloor observatory," EOS Trans. AGU, 92, 169, doi: 1029/2011EO200002, 2011. Hydrothermal plumes venting from black smokers and diffuse flow discharging from the surrounding area of the seafloor are important as agents of transfer of heat, chemicals, and biological material from the crust into the ocean in quantitatively significant amounts. An unprecedented time series of three-dimensional (3-D) volume images of plumes rising tens of meters from black smoker vents and of concurrent 2-D maps of diffuse flow discharging from surrounding areas of the seafloor illuminates the turbulent behavior of hydrothermal fluid transfer into the ocean. Light, R., V. Miller, D.R. Jackson, P.A. Rona, and K.G. Bemis, "Cabled observatory vent imaging sonar," J. Acoust. Soc. Am., 129, 2373, doi: 10.1121/1.3587685, 2011. A cabled observatory vent imaging sonar (COVIS) has been developed to provide plume and Doppler imaging of hydrothermal vents and surrounding diffuse flow. The system was designed to be compatible with the power and data interface standards of the Neptune Canada cabled observatory. 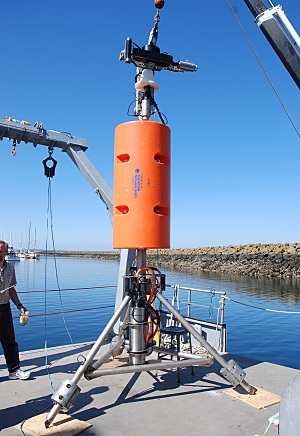 COVIS is a 4 m tall, titanium tripod employing a Reson 7125 multibeam sonar. The sonar transducers are positioned by a motor-driven three degree of freedom rotation system (pitch, roll, and yaw). A 400 kHz, 1 x 128 deg fan-beam projector is used with a receiver array that forms 256 beams having horizontal width 0.5 deg and covering a 128 deg azimuthal sector. Volumetric imaging of plumes is generated as the transducer array is scanned in 1 deg pitch steps. Doppler measurements of flow velocity over a 3-D grid are also derived. A 200 kHz, 28 x 128 deg broad beam projector is used to image the diffuse areas near the base of the hydrothermal vent edifices. Software allows for the creation of complex, arbitrary, autonomously executed experiments that control all aspects of the sonar and rotation system. COVIS was successfully deployed in September 2010. The design of COVIS provides insights relevant to future cabled acoustic systems.